Hannan senior Josie McCoy (2) hauls in a rebound in front of classmate Pammie Ochs during the second half of Thursday night’s girls basketball contest against Teays Valley Christian in Ashton, W.Va.
ASHTON, W.Va. — A fitting farewell for this dynamic duo. 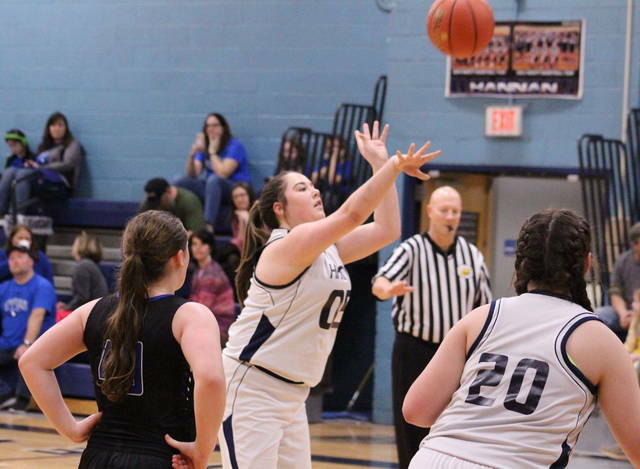 The Hannan girls basketball team had eight players reach the scoring column while sending upperclassmen Pammie Ochs and Josie McCoy out in style on Thursday night with a 57-19 victory over visiting Teays Valley Christian in a non-conference matchup in Mason County. 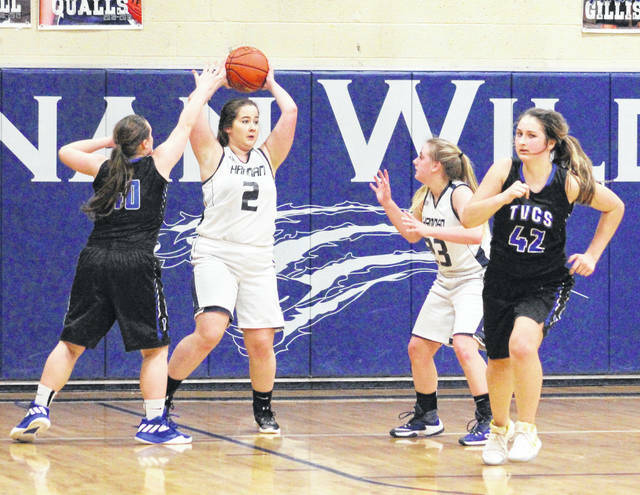 The Lady Wildcats (7-9) celebrated Senior Night in a decisive fashion as the hosts limited the Lady Lions to single digits in all four quarters while gradually pulling away for the 38-point triumph. 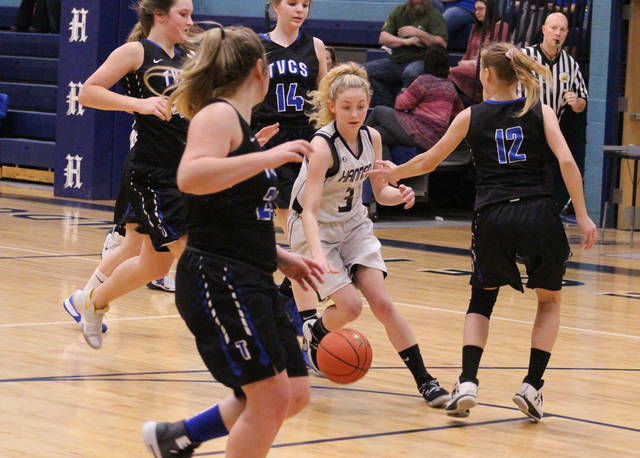 The win also allowed the Lady Cats to claim a season sweep after posting a 55-19 decision at TVCS back on Jan. 8. Hannan built a small 10-6 edge through eight minutes of play, but the hosts received five points from Julie Frazier as part of a 12-2 second quarter surge that turned a small two-possession cushion into a commanding 22-8 advantage at the break. Bailey Coleman and Madison Plantz both contributed four points apiece during a 15-8 third period push, which ultimately resulted in a 37-16 edge headed into the finale. Halie Johnson scored five points, while the trio of Plantz, McCoy and Rachel Ellis each chipped in four points as part of a 20-3 charge down the stretch that wrapped up the 57-19 decision. Both McCoy and Ochs are four-year members of the varsity girls basketball program, as well as multi-year letterwinners in both volleyball and softball. As seventh-year HHS coach Kellie Thomas noted afterwards, this senior duo has been part of a lot of athletic endeavors during their time in the Blue and White. Thomas was pleased to send those that pair out with a win in their final home contest, and she was also thrilled that a majority of her underclassmen played such a vital role in helping make this night a success. “This group of girls, they’ve been unbelievable this year. They’ve stuck together and we’ve managed to put together some successful nights on the court. It’s been fun to watch us grow as a family,” Thomas said. “Pammie (Ochs) and Josie (McCoy) have been the leaders of this group, and this might be the first Senior Night that we’ve won since I’ve been coaching here. This was a great milestone for us, and those two seniors deserved to leave here tonight with their heads held up high. The Lady Cats netted 24 total field goals — including four trifectas — and also went 5-of-12 at the free throw line for 42 percent. McCoy paced the hosts with a game-high 11 points, followed by Ellis, Johnson and Plantz with eight markers apiece. Frazier was next with seven points, while Coleman and Ochs each contributed six points. Tonika Coleman completed the winning tally with three markers. The Lady Lions netted seven total field goals — including a single 3-pointer — and also went 2-of-4 at the charity stripe for 50 percent. Chloe Harper and Anna White led the guests with four points apiece, followed by Chloe Ferrell and Samantha Stevenson with three markers each. Kayla Facemyer and Beth Ray completed the respective scoring with two points and one point. Hannan returns to action Monday when it travels to Buffalo for a non-conference matchup at 6 p.m. The Lady Cats also play on Tuesday when they head to Carter Christian for a 6 p.m. tipoff.